"Ghost Gum #2" by Barbara Bartlett. Paper dyed with eucalyptus leaves on canvas, 6” x 6”. Reprinted by permission of Barbara Bartlett; all rights reserved. Sunday, September 24, 2017, 1-3 p.m.
A love of nature greatly inspires my life as an artist. In recent years, the process of collecting and incorporating natural materials - seed pods, grasses, leaves, and various plant elements - directly into my work has allowed me to experience how a simple object can be transformed through the creative process. Alchemy, a collection of my newest work, explores change that is possible through experimentation and the manipulation of materials. Spending part of each year living in Sydney, Australia, I have become intrigued by the beauty, fragrance, and genus of the country’s 300 varieties of native eucalyptus trees. Recently I have begun to incorporate eucalyptus leaves into my work by experimenting with ways to transfer their impressions to paper and fabric. Most of the pieces in this exhibition* are the result of an experimental dyeing process in which the oily leaves are pressed between layers of paper or cloth, tightly bundled, immersed in a simmering cauldron, then left cure overnight. The process results in unpredictable magic, and I find it exciting to discover the unique colors and patterns that emerge the next morning. It is this transformation that so encourages me to assemble, enhance and combine the images to produce the final work. I love the fact that mystery drives this creative process, and in doing so, fully engages me in experiencing the rich possibilities of change! *Fifty percent of the proceeds will go to the Harvard Square Homeless Shelter, a student-run homeless shelter housed on the lower level of University Lutheran Church. Barbara Bartlett grew up in the Chicago metropolitan area and pursued a career in special education and social work before following what had been a long-term interest in art. The Boston area was home for 30 years until she moved to Vermont in 2006. Since the late 1990s, Barbara has devoted herself full-time to the study and creation of art. 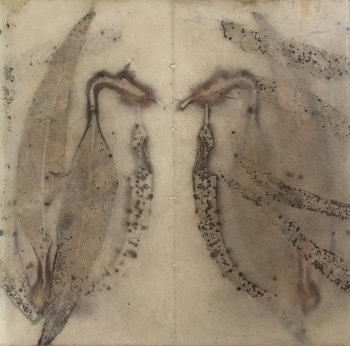 Her work has been exhibited throughout the country and in Australia and is represented in private and corporate collections in the United States, Europe and Australia. She is currently represented by West Branch Gallery in Stowe, Vermont. Barbara divides her time between studios in Vermont and Sydney. Barbara initially studied watercolor and acrylic painting, but soon became drawn to printmaking. The aspects of layering and texturing it offered easily translated into mixed media, which has been the focus of her work for the past several years. While still continuing to create some two-dimensional work, most recently she has become fascinated by the possibilities of working three dimensionally, using re-cycled or re-purposed material as much as possible. Her work can be viewed at barbarabartlettart.com.